"Terminal Velocity" redirects here. For the DS version of the stage, see Terminal Velocity (DS). Terminal Velocity is the final stage of Sonic Colours. It unlocks after beating the 6 bosses of the previous zones. As all the generators are destroyed, Sonic, Tails, and the Wisps start celebrating at Tropical Resort. However, this is short lived, as the resort itself begins to fall apart due to Rotatatron's arm stuck on one of Tropical Resort's 8 Hyper-Go-On Lasers. Sonic and Tails realize it's time to escape, and head for the elevator to the planet's surface. However, once they reach the elevator, they are confronted by Eggman, in the Nega-Wisp Armor. After Sonic taunts the infuriated doctor, he pushes Tails into the elevator in an attempt to stop his buddy getting hurt. Sonic then turns his attention to Eggman, and thus the final level begins. 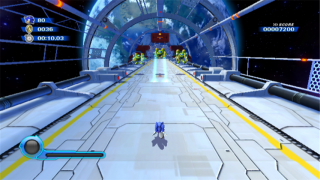 Act 1 - Sonic runs down the giant structure towards the elevator, facing off against Aero-Chasers, Moto Bugs, and has a final showdown with one of the the Huge Spiked Robots. Boss - Sonic faces off against Eggman's final machine, powered by Wisp energy. Act 2 - As the resort finally begins to crumble, Sonic dashes away down the structure once more, attempting to outrun an explosion. This level does not actually have any kind of ranking at all, instead it is just a basis for the final cutscene. This page was last edited on 6 March 2018, at 08:00.